Native to the Congo river basin in Tanzania and Democratic Republic of Congo. It’s also found in Lake Tanganyika. An active species that needs a tank measuring at least 48″ x 18″ x 18″ (120cm x 45cm x 45cm) – 255 litres. It requires a good flow of water through the tank, and decent oxygenation. The choice of decor isn’t critical, but a substrate of sand with some driftwood branches, and perhaps some smooth rocks can look very effective. Try to leave as much open swimming space as possible. Omnivorous. Offer a mixture of live, frozen and dried foods. Prawns and live earthworms are particularly relished. Peaceful with anything that isn’t too small as to be considered food. 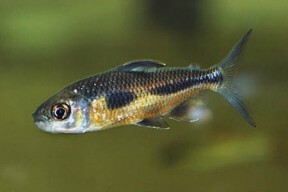 Best kept with other similarly-sized characins, robust cichlids, Loricariids and other bottom dwellers such as Polypterus species. It’s a shoaling species so buy a group if possible. This rarely imported species makes an attractive addition to a community of larger peaceful fish. It is farmed commercially for food in its native countries.